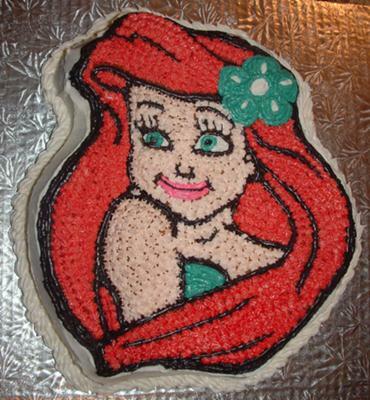 I made my first cake and it was an Ariel Cake from the Little Mermaid. It was a lot easier than I had expected. I rented the Little Mermaid Cake Pan from a local Bulk Food Store for $1.99. I had to also purchase 3 icing tips (each were just a couple of dollars) and I had all the rest of the ingredients at home. I sprayed the Little Mermaid Cake Pan (Wilton Cake Pan) really well with Pam and it slipped out perfectly. The Ariel Birthday Cake Pan had left the lines indented into the cake. I used the Wilton icing tip #3 (to make the lines), the Wilton icing tip #16 (to make a star shape) and Wilton icing tip #21 (around the base of the cake). All I had to do was outline the indented lines and then fill in the colours. The cake pan came with Wilton cake decorating instructions and how to use the different tip, etc. It was just like colouring a picture. I found the experience very relaxing and I am so proud of my first cake! Everyone just loved my Little Mermaid Birthday Cake. Your cake looks amazing! That was your First cake? You definitely have a talent! Lucky kids! Good Job!